One in three households say they plan to move in the next five years, according to a survey conducted by the Demand Institute of 10,000 households’ current living situations. It’s the location of the home that will be driving most of those moving decisions — more so than the physical home itself. More than half (59 percent) of households say they plan to move within 30 miles of their current home. For those seeking a different location based on climate, the Western and Southern U.S. continue to be the top destinations. Many are looking for walkable communities. There is an upturn in home price growth in walkable communities compared to less walkable communities, according to the Demand Institute’s report. Those who reside in walkable communities also are more likely to report that their quality of life has improved in the past few years due to their change in residence. According to Jeff Speck, author of Walkable City, Downtown Raleigh has the bone structure to being a great walkable city. In 2014, 36 street level businesses opened their doors which are 95 percent locally-owned. Downtown Raleigh’s green spaces are being upgraded and new ones will be added in the coming years. Lisa Southern Real Estate, located at 15 E. Martin St, Raleigh, NC 27601, was founded in 2005. If you are looking to move to Raleigh, NC or the surrounding area, call us today at 919-800-0800 or start your home search by visiting our website! If you are interested in see how much your Raleigh, NC home is worth in today’s real estate market, please fill out this form today! 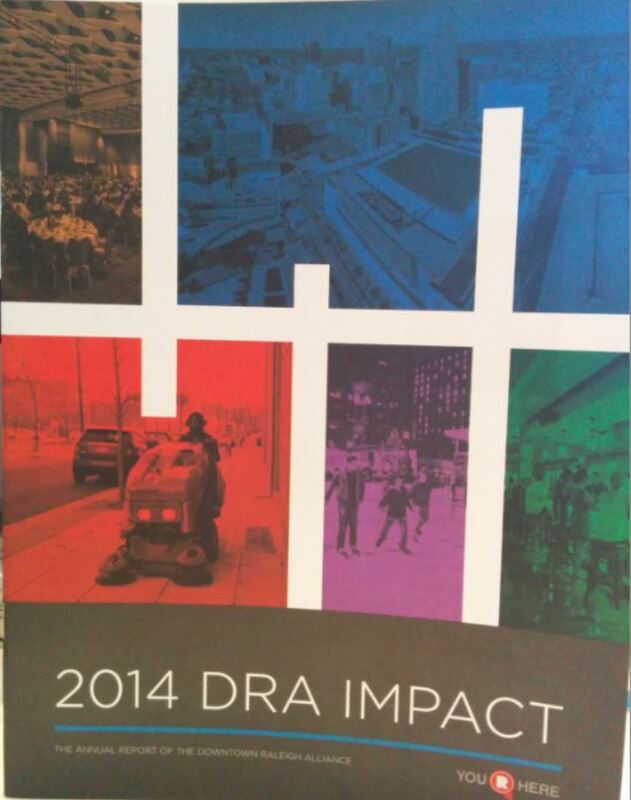 The Downtown Raleigh Alliance (DRA) Annual Meeting was held in the Convention Center on February 19, 2015. There were over 2,000 attendees; a mix of business owners, residents, and local employees. The focus of the meeting was to recognize the accomplishments of 2014 and to set the vision for not only 2015 but for years to come. As attendees sat down, it became obvious that tables were decorated in different color tablecloths and there were street signs lining the perimeter of the room. It became appearant that the room was cleverly broken into a representation of downtown’s five districts to demonstrate the smooth walkability of Downtown Raleigh. 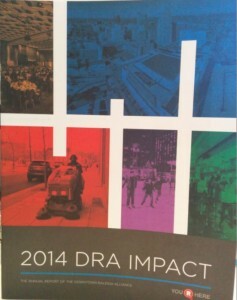 Thomas Hill, the DRA Board Chair started the evening with a snapshot of the organization’s impact in 2014. Downtown Raleigh was kept attractive with the Ambassador Clean Team and new clean machines removing close to 70,000 pounds of trash. The Ambassador Safety Team spent over 7,000 hours patrolling parking decks, surface lots, and the streets to ensure a safe and friendly environment. A vibrant downtown atmosphere was created with activities with over 80% of downtown merchants benefiting from promotions such as First Friday Raleigh Art Gallery Walk, Downtown Raleigh Gift Card, Downtown Raleigh Restaurant Week, The Raleigh MIX, and Shop Downtown Raleigh. Downtown Raleigh saw 33 street-level business open their doors in 2014. Keynote Speaker, Jeff Speck entertained us through his presentation of The Walkable City. He introduced us to The General Theory of Walkability, which states that in order to get people to walk, you have to give them a reason to walk. So, how do you get people to walk? There are four main ways, give them a reason to walk, a safe walk, a comfortable walk and an interesting walk all simultaneously. A reason to walk is to plan a downtown that has residential, business, schools, and worship close to each other. He authoritatively expressed that Downtown Raleigh has the perfect bone structure, and is heading in the direction of a truly walkable city. If we are cognizant to add bike lanes and use more two lane roads, Downtown Raleigh will be well on it’s way to becoming a downtown that everyone will want to visit. Lisa Southern Real Estate & Property Management is a true family owned business. We live and work in Downtown Raleigh. Our offices are located at 15 E. Martin St in the heart of downtown Raleigh and we live on the top floors of the building. If you are interested in buying a property in the Raleigh area or selling your Raleigh area home, visit our website, give us a call at: 919-800-0800 or stop by our office TODAY! We look forward to meeting you!